Quantum elliptical trainers are mid-drive machines which are quite a bit different from the more traditional forms of ellipticals with the flywheel located at either the front or the rear. They are the design of a Houston-based firm which is better known for making medical and physical rehabilitation equipment. Rather than re-invent the proverbial (er, elliptical) wheel, Quantum chose to pursue a new philosophy of developing cardio workout equipment for the home gym. It wasn’t a stretch for them to get into the field since the company is well-acquainted with fitness machines; they make health club abdominal machines and they are also manufacturing treadmills. Quantum elliptical trainers are expensive machines ranging from $2799 to $3799. The Quantum design team has taken a biomechanical engineering approach by working to reduce stress on the joints using a center-drive design with a 21” stride length. But how innovative is it? Other companies have done similar studies of the human body and can also boast of including advanced features in order to alleviate joint strain. In other words, as pros will tell you, just because these machines come from a firm that made rehab equipment doesn’t necessarily translate into the best designed elliptical trainer for home users. A Quantum elliptical is an elegant-looking machine that doesn’t take up a long footprint like traditional models do, coming in at just 44” in overall length. As for the ergonomics; while these trainers do offer a comfortable ride, there is nothing measurably better about them than competitor models. In other aspects, the noise level is just average, but the warranty is one of the best in the business. And Quantum Fitness is to be given its proper dues for the quality of components, the overall construction, and the attractive profile. It’s hard to sell elliptical lovers on a center-drive design so Quantum will turn off a number of potential buyers for that reason alone. Likewise, in areas of performance, reviews thus far have not been kind in regards to the just average ergonomic feel and the intended oval motion. Ultimately, for such a steep price the value of Quantum elliptical trainers is questionable, and why would you choose a Quantum over a Precor, Lifefitness, or a Star Trac if you intend to spend that much money? Quantum Rehabilitation Stride Elliptical - Compact enough to fit in the corner of any room. Low step-up height and secure handrails for a safe, comfortable, and convenient daily workout. 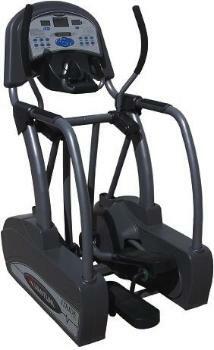 Quantum Q-210C Elliptical - a compact center-drive model with low step-in height and narrow pedal spacing.